I love writing about sports, particularly about NBA players. A cement impression of Michael Jordan's hands allows you to test your hand size against those of this basketball legend. Having big hands can be a nice advantage in basketball. It gives you the ability to easily palm the ball which, though not critical, can be very helpful. This can affect passing, shooting, and ball handling. Basketball, ultimately, is about ball control. You can imagine how much easier it would be to play if the ball felt like a softball in your hands. You would have so much control. Some NBA greats like Michael Jordan and Julius Erving benefited from having huge hands. Obviously, it wasn’t the only reason these players were great but it was a huge advantage and probably why they were able to finish so well at the rim. Kobe Bryant recognized this advantage. When asked what he wished he could change about his game, his answer was his hands. He revealed he wished he had massive hands like Michael Jordan. Also, when Phil Jackson was asked who would win in a game of one-on-one between Jordan and Bryant, the Zen Master went with MJ. 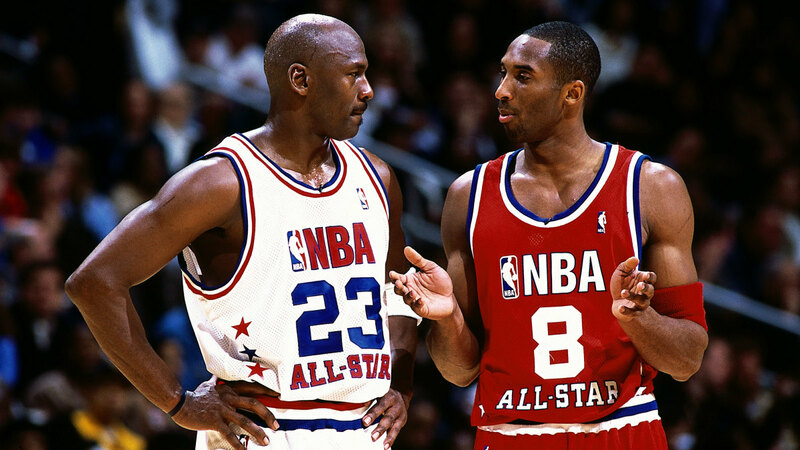 His main reason for picking MJ was simply because of the hand size advantage he enjoys over Kobe. This article will take a look at some NBA players both past and present with the most impressive hand sizes. Both the hand length and span of the players will be considered. Reasonable estimates will also be made on the sizes of players that have not been officially measured. It's usually obvious who has the biggest hands though. They're the ones who can wave the ball around like a grapefruit and don't need the off hand to secure the ball. Elgin Baylor: Estimated to be 9.75/11 inches. How Is Hand Size Measured in the NBA? The NBA has measured the length and span of prospective rookie hands since the 2010 Combine. Hand size measurement consists of two parts; hand length and hand span. Hand length is measured from the base of the palm to the tip of the middle finger. Very few NBA players have hand lengths of 10 inches or longer. Examples include Robert Upshaw, Andrew Nicholson, Jaren Jackson Jr, Isaac Haas, and Dexter Pittman. The average hand length for a male is around 7.4 inches. Hand span or spread is measured from the tip of the thumb to the tip of the pinky finger with your hand outstretched. It’s extremely rare for even an NBA player to have a hand span of 12 inches or wider. Gregory Smith and Giannis Antetokounmpo are a few who can boast of such measurements. The average male’s hand span is about 8.5 inches. An individual’s span is almost always greater than his length. However, there are rare cases where the opposite is the case. Joseph Young of the Indiana Pacers strangely has a hand span of 7 inches, which is less than his hand length of 8.25 inches. NBA players like Anthony Davis, TJ McConnell, Markieff Morris, Harrison Barnes, and Alec Burks also have hand spans that are smaller than their hand lengths. It’s also not uncommon for some players to have their spans and lengths be equal. 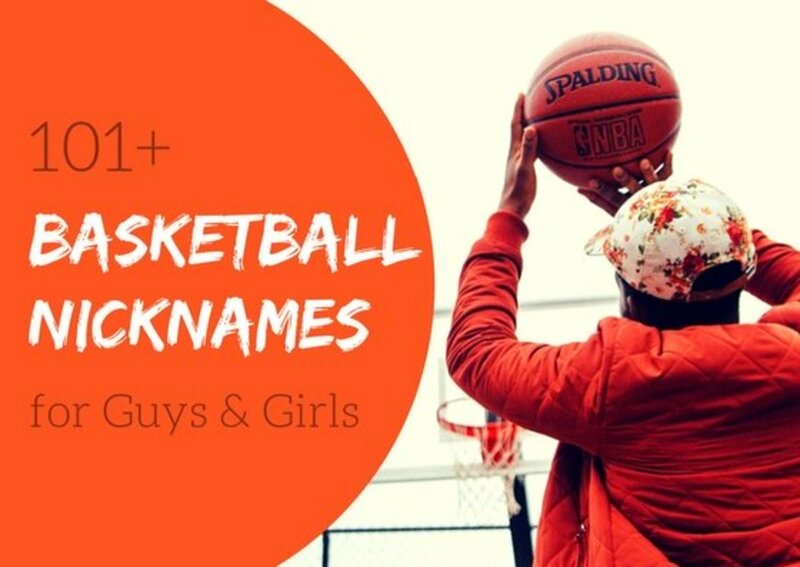 NBA players like JaMychal Green, Al Farouq Aminu, Sean Kilpatrick, and Andre Drummond fall under this category. The difference between these two measurements rarely exceeds two inches. Hassan Whiteside, Noah Vonleh, and Phil Pressey are few of the NBA players whose hand spans exceed their hand lengths by at least 2 inches. 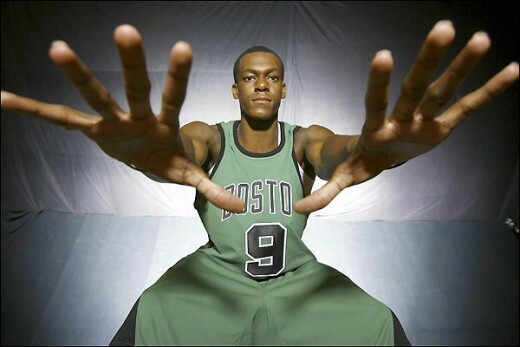 Rajon Rondo’s hand length measures 9.5 inches and his hand span measures 10 inches. At just 6’1", his length is roughly around that of a 7’5” person. The average at his height is around 8.3 inches. This means Rondo’s hand length is around 14% longer than the average. His hand span is also equivalent to the average of a 7’1" man. With the average hand span for someone his height being around nine inches, Rajon’s span is around 11% wider than the average. Interestingly, he has the same hand span as 6’11" Demarcus Cousins and a longer hand length than him as well. Connie Hawkins was inducted into the Hall of Fame in 1992. 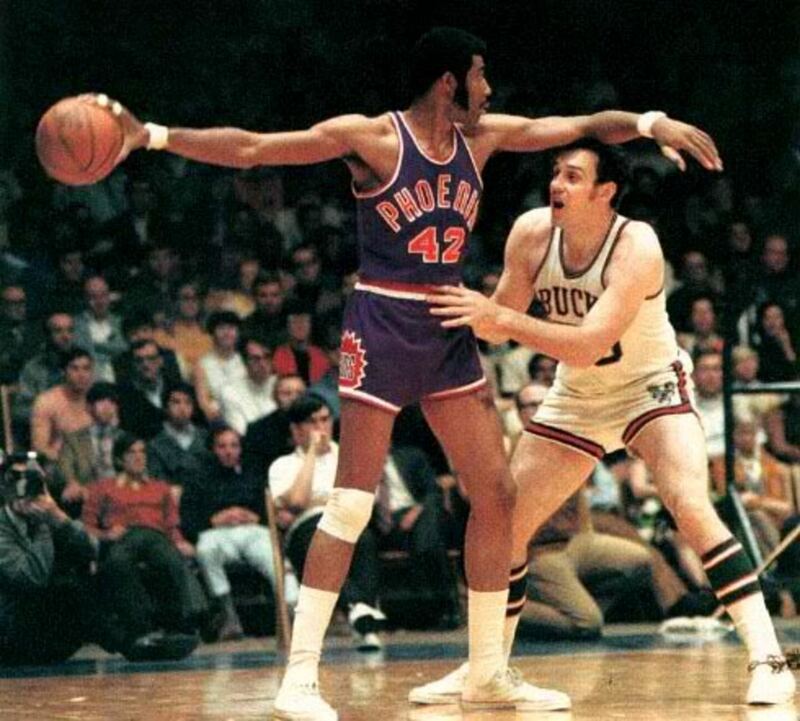 Connie Hawkins could palm the ball with ease and finish in any way he liked at the rim. This was due to his uncommonly large hands, which were 10.5 inches in length and 11 inches in span. Hawkins’s hand length and span are close to the average for a man standing close to 8’0". Amazingly, he stood at 6’8". His length is around 18% longer than the average for his height. 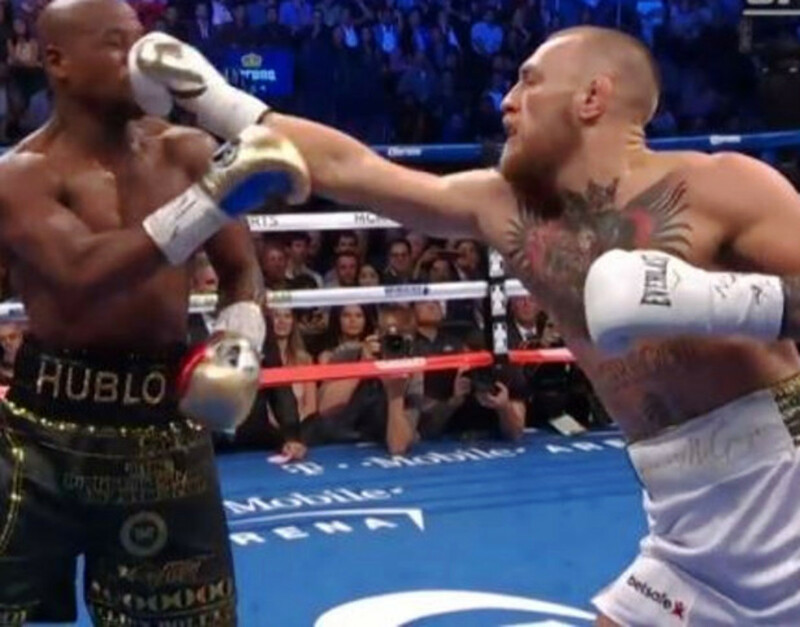 His hand span was around 13% wider than average as well. Lebron James stands at the same height as Hawkins but he can only boast of a hand length and span of nine inches and nine and one-quarter inches respectively. It was said that when Kawhi Leonard was born, his mum immediately noticed that his hands were disproportionate to the rest of his body. He had enormous hands even as a baby. His mum knew that nobody could switch babies on her. As a freshman at Canyon Springs High, Leonard was a wide receiver on the football team. His school didn’t have receiver gloves that fit him in the equipment room and they had to send him to a local sporting goods store to get some. Unfortunately, the biggest size in the store didn’t fit him and they finally had to special order some. At 6’7", Leonard possesses a hand length of 9.75 inches and a hand span of 11.25 inches. The average length and span of a 6’7" person are around 8.8 inches and 9.5 inches respectively. Kawhi's length is 10.8% longer and his span is about 18.42% wider than the average for his height. Terrence Ross and Draymond Green stand at the same height but their hand sizes are nowhere near Leonard's. Shaq won three consecutive championships with the Los Angeles Lakers. 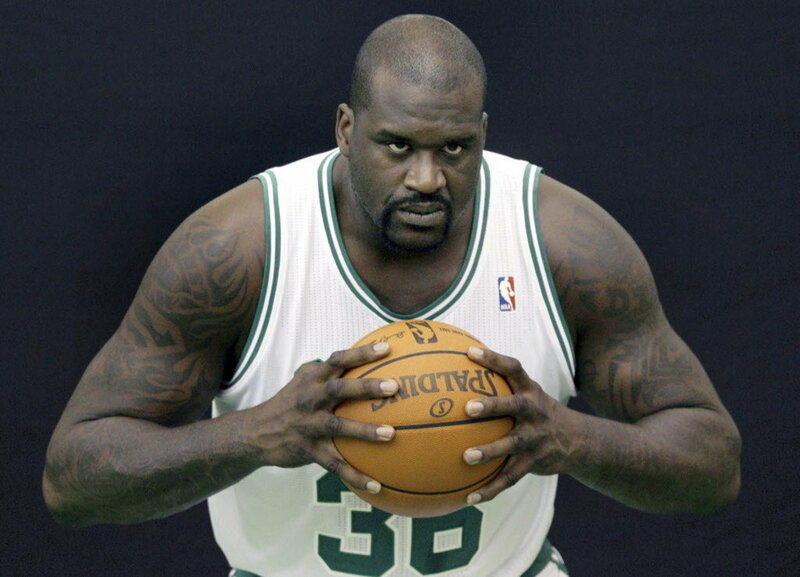 It's difficult to find accurate measurements on the hand size of Shaquille O'Neal. Fortunately, Shaq compared his hands with Kawhi Leonard on live TV whose hand size we know with certainty. 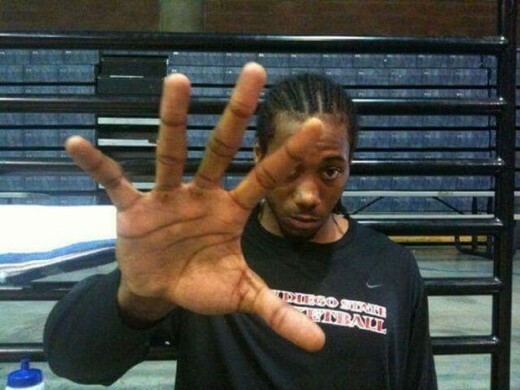 His hands were quite bigger than Kawhi's. Shaq's hand length seems to be at most half an inch longer than Kawhi's. Their hand spans also look like they don't differ by more than three-quarters of an inch. It's, therefore, safe to say Shaq's hand length is in the range of 10-10.25 inches and his hand span in the range of 11.75-12.00 inches. Wilt Chamberlain stood at almost the same height as Shaq but possessed a hand length and span of 9.5 inches and 11.5 inches respectively. Kawhi's hand size is also pretty impressive if you consider the fact that he stands 4 inches shorter than Shaq. 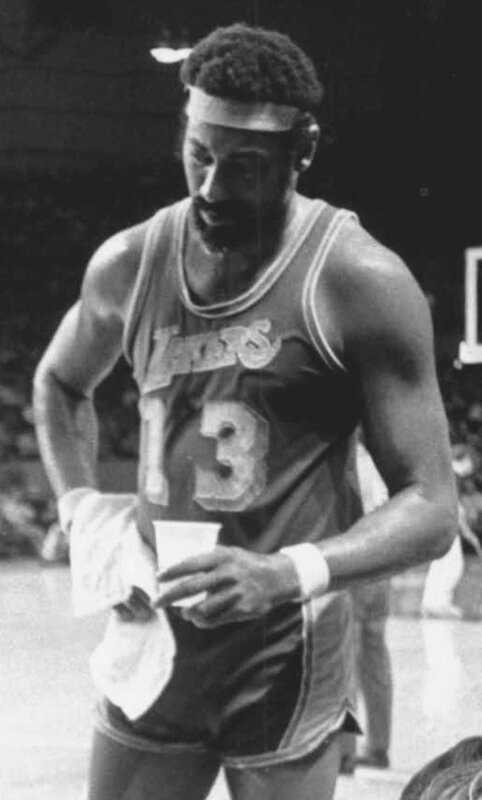 Wilt’s hand size certainly contributed to his status as one of the most dominant players in NBA history. His hands which were 9.5 inches in length and 11.5 inches in span were not particularly impressive for someone his size but they were still significantly bigger than the average. Wilt’s hand span was around the average for a man standing close to 8’0" and was around 15% wider than the average for his height. His hand length was around the average of a 7’6” man and was around 3.3% longer than the average for his height. Michael Jordan is the greatest basketball player of all time. 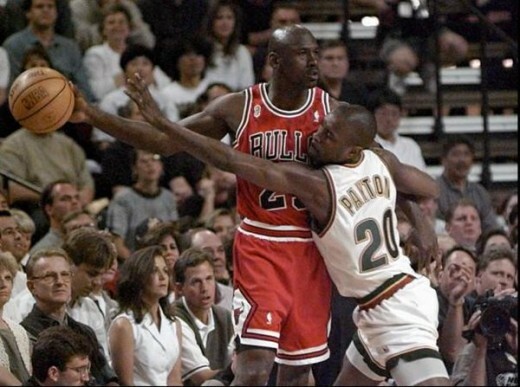 Michael Jordan’s hand length and span are 9.75 inches and 11.375 inches respectively. Jordan stands at 6’6" but his hand length is around the average for a man who is 7’9”. His hand length is around 12.1% longer than the average for his height, which is about 8.7 inches. His hand span is also 21% wider than the average for his height, which is around 9.4 inches. Jordan’s hand span is around the average for a man who stands close to 8’0". Surprisingly, he has a longer hand length than Wilt Chamberlain, though Wilt’s hand span was wider. 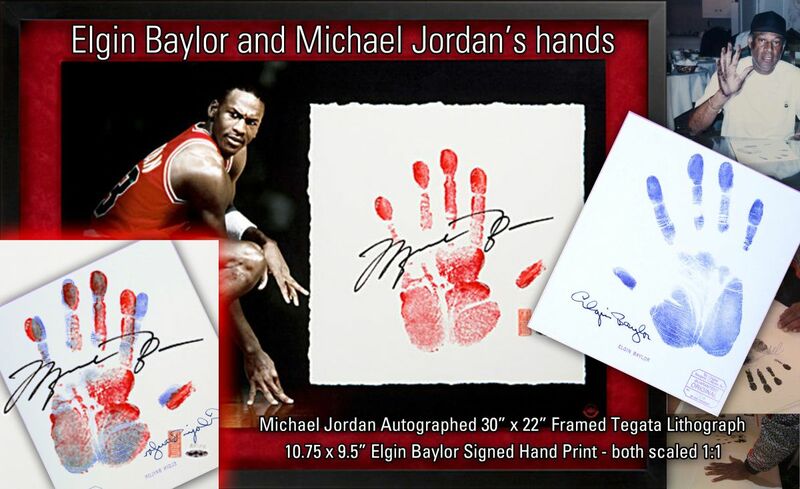 The hand print of Michael Jordan (in red) and Elgin Baylor (in blue). Anyone can tell Elgin Baylor had huge hands from the way he handled the ball. Unfortunately, getting accurate measurements on his hand size has proven difficult. 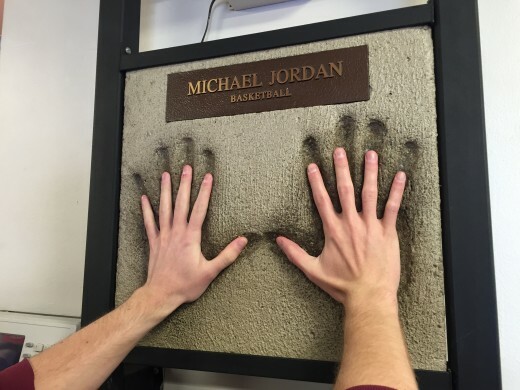 However, a comparison with the handprint of Michael Jordan shows that Baylor has roughly the same hand length. MJ's thumb appears to stick out further for some added spread, giving him a slightly wider hand span than Baylor. It is therefore safe to say that Baylor's hand length is around 9.75 inches and his span is around 11 inches. This is really mind-blowing considering he stands at 6’5". This 6’9" power forward is gifted with the physical tools required to make it big in the NBA. His hand size is incredible for his height. The average hand length of a 6’9" individual is around nine inches while the average for the hand span is around 9.7 inches. Vonleh's length is 9.75 inches while his span is 11.75 inches. He recorded both the longest hand length and widest hand span in the 2014 Draft Combine. Paul George’s hand length is 14.7% shorter than Vonleh's despite standing at the same height. George's hand span is 30.5% narrower as well. 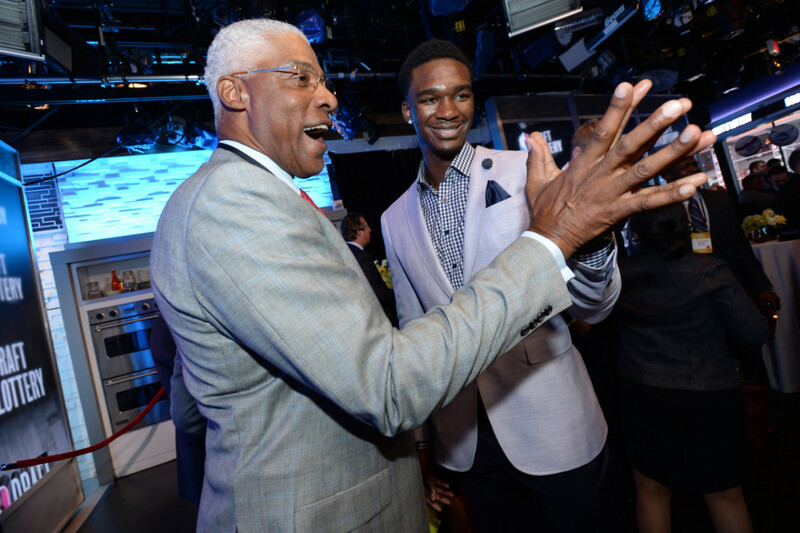 Julius Erving’s hands have always been big for his size. It was said that Dr. J could palm a basketball off the dribble when he was in junior high school. Erving’s humongous mitts allowed him great control of the ball which enabled him to throw down almost any kind of dunk imaginable. The way he could swing his arms around with so much speed while palming the ball was unbelievable. His hand size has been the subject of many debates. Erving’s hand size has been estimated to be as low as nine inches in length and 11 inches in span to as high as 12 inches in length and 13 inches in span. 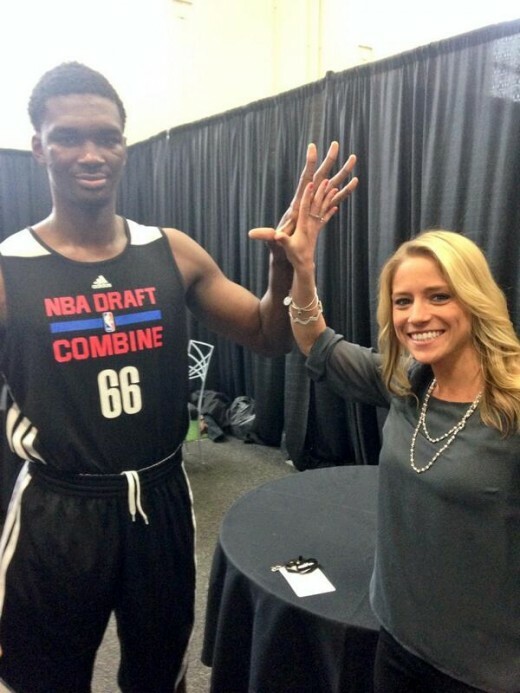 Fortunately, Erving did us a favour by comparing his hands with Noah Vonleh, whose hand size we know with certainty. Vonleh’s hand length appears to be about a quarter of an inch longer than Erving's. However, there is very little difference in their span. Though Noah’s thumb is longer than Dr. J’s, it doesn’t stick out like MJ’s does. Dr. J’s hand length is probably somewhere around 9.5 inches. His hand span is also probably around 11.75 inches. His hand size is not far behind one of the largest hands ever measured at the Draft Combine. It’s even more impressive considering he stands shorter than Vonleh. This 6’8" gentle giant has a large set of mitts for his height. Unfortunately, it’s difficult to find consistent data about his hand size. Embry’s hand span is believed to be 12 inches. His hand length measurement is unknown. Like Dr. J, Embry volunteered to compare his hand with Noah Vonleh and so we can use this to predict what his true hand measurements are. Vonleh’s hands are at least 0.5 inches longer than Embry’s in length. Their spans are about the same. The hand length of Embry should therefore be about 9.25 inches and his span around 11.75 inches. Lebron James is the same height as Wayne Embry and his hands are nowhere near his size. Jahlil Okafor is one of the few people in the world who can hold 13 tennis balls in one hand. The average person can hold a maximum of six. He also stunned everyone when he held three apples in one hand for a draft photoshoot. 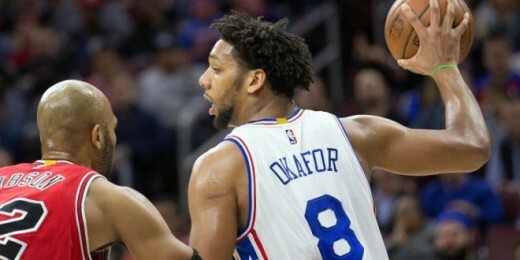 Okafor’s hand span measures 11.25 inches and so it’s not surprising that he can do some remarkable things with his hands. Unfortunately, there is no reliable data on his hand length but it is safe to assume it should be at least 9.5 inches. At 6’11", he has exceptionally big hands for his size. Nerlens Noel stands at the same height as Jahlil but his hand span is 12.5% narrower. Remarkably, Okafor has a wider hand span than 7’0" Steven Adams. 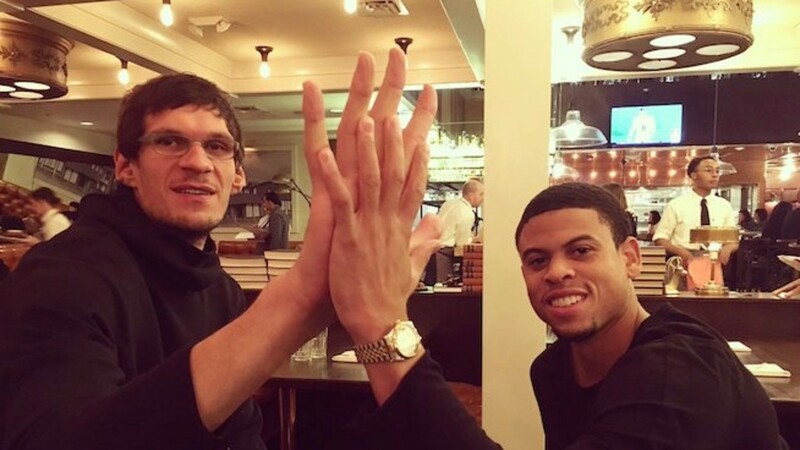 Boban Marjanovic may hold the unofficial title for largest hands ever in the NBA and probably in the world. Unfortunately, he hasn’t had his hands officially measured. Some sites put his hand span at 14 inches which is highly unlikely. 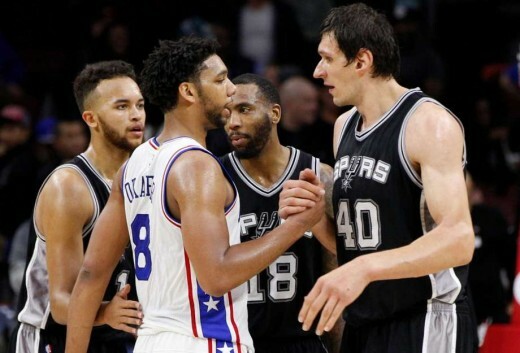 A pic of Boban shaking hands with Okafor shows his hands are not significantly bigger than Okafor’s. It will be interesting to see him compare hands with some of the big boys like Vonleh and Giannis to gauge his true hand size. Most of the people he has compared hands with have had average to below average sizes. In 2016, he compared hands with his former teammate Ray McCallum whose hand size has been officially measured. We can thus use this to estimate his size. At 6’3", McCallum has pretty small hands for his height. His hand length is only eight inches and his span is 8.75 inches. From the pic above, it is pretty obvious that Boban’s hand length is at most three inches longer than McCallum’s. Their hand spans also don’t differ by more than 3.5 inches. Boban’s hand length is therefore likely to be in the range of 10.75 to 11 inches. His hand span is likely in the range of 12-12.25 inches. This is not far off from the measurements of the tallest living person who is a foot taller than him. Gregory Smith last played for Osaka Evessa in the Japanese B.League. He plays both center and power forward. 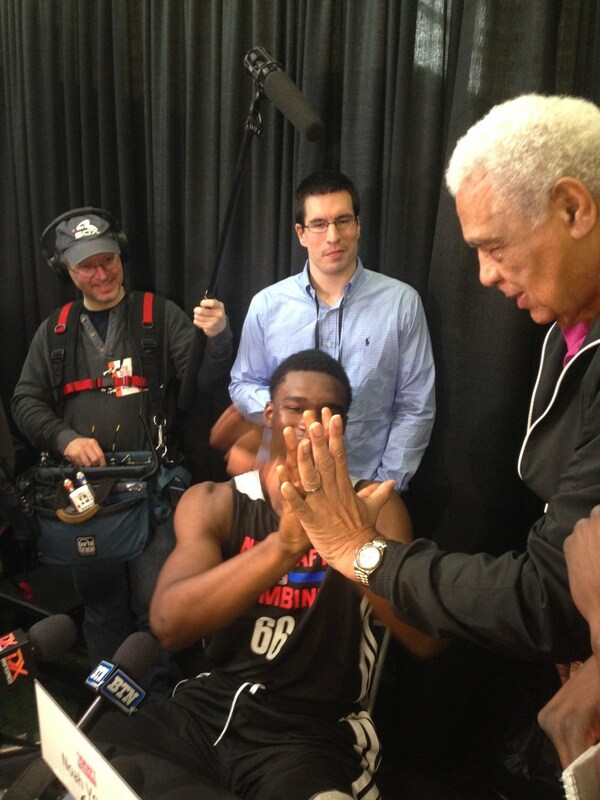 Greg Smith has one of the largest hands ever measured at the Draft Combine. His hand length measures 9.8 inches and his hand span is 12 inches. Smith has the same span as 8’3" Sultan Kösen. This is truly astonishing if you consider the fact that he stands at 6’10". His hand length is also close to the average for a 7’9" man. Gregory’s hand span is around 21% wider than the average for his height. His hand length is around 8.9% longer than the average. Smith beats his 2011 draft mate Nikola Vučević in both hand span and length despite Nikola standing at almost 7’0". 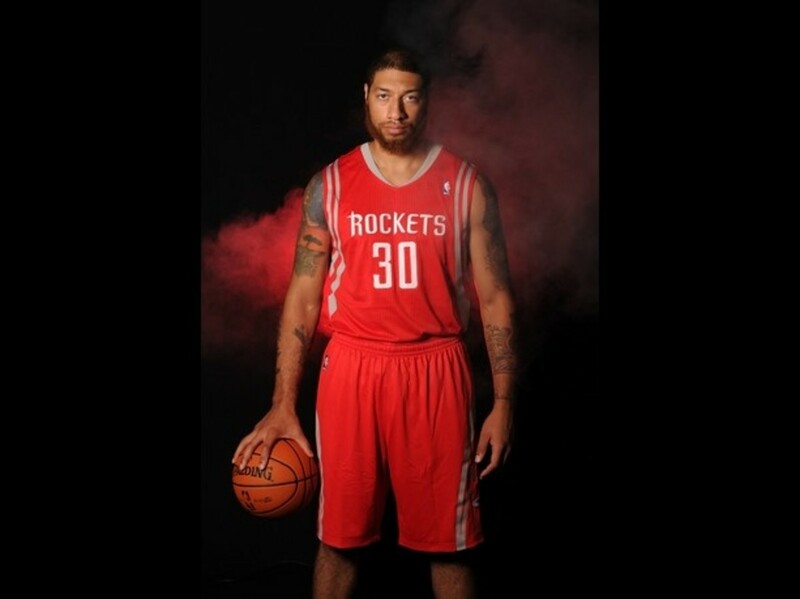 Royce White currently plays for Auxilium Torino in the Italian LBA. The average hand length of a 6’8" person is around 8.9 inches. The average hand span for that height is around 9.7 inches. Royce stands at 6'8" but his hand length is 6.74% longer than the average. His hand span is about 18.56% wider than the average as well. His span of 11.5 inches was the widest at the 2012 Draft Combine. Amazingly, he has the same hand size, both in span and length, as 7’1" Wilt Chamberlain. Milwaukee Bucks forward Giannis Antetokounmpo is nicknamed the "Greek Freak" due to his athleticism. This insanely talented 6'11" forward who plays like a point guard is one of the few players in the NBA who can boast of a 12-inch hand span. This is the same span as the tallest living person in the world, Sultan Kosen, who stands at 8’3". His outrageous hand length of 9.85 inches is also something worthy of mention. The Greek Freak has a 20% wider hand span than 7’1" Rudy Gobert. Interestingly, his hand length and span are 12.6% longer and 26.3% wider respectively than Greg Monroe, who is also 6’11". Other players with huge hands for their height but who were unable to make it on the list include Quincy Acy, Trevor Mbakwe, Shannon Brown, Walter Herrmann, Vince Carter, Larry Nance, Chris Webber, John Stockton, Tracy McGrady, James Worthy, Leon Powe, Elton Brand, and Scottie Pippen. While they may not be particularly impressive, here are some hand sizes on some of the top stars who have come through the NBA. The king had his hands measured at nine inches in length and 9.25 inches in span. These are a decent size considering his height of 6'8". His three NBA Championships show that his hands have served him well. Bryant's hand have been measured to be roughly nine inches in length. At 6'6", this is somewhat average by NBA standards; they are certainly not impressive. Kobe has admitted he can't palm a ball and claims he is envious of the mitts of Dr. J. Coach Phil Jackson has claimed he would pick MJ over Kobe in a game simply because of their size difference in their hands. Unfortunately, Stephen Curry's hands have not been officially measured. However, anyone who has watched Curry play can easily tell his hand size isn't all that impressive. They seem to be pretty average for his height which means his hand length should be around 8.5 inches and hand span around 9.0 inches. The fact that he is one of the best shooters to ever grace the NBA seem to support the hypothesis that not so big hands might be beneficial towards accurate shooting. Some basketball players are not gifted with large hands. Some even have the drawback of being on the smaller side. This doesn't mean they can't be great. While small hands will lack the ability for more control on the ball, many report that smaller hands are more beneficial towards accurate shooting. Here are some NBA players who have small hands. Brown was a center who stood at 6'11". He was drafted at number one by the Washington Wizards in 2001. He was seen as unimpressive and is now considered to be one of the worst number one draft picks. 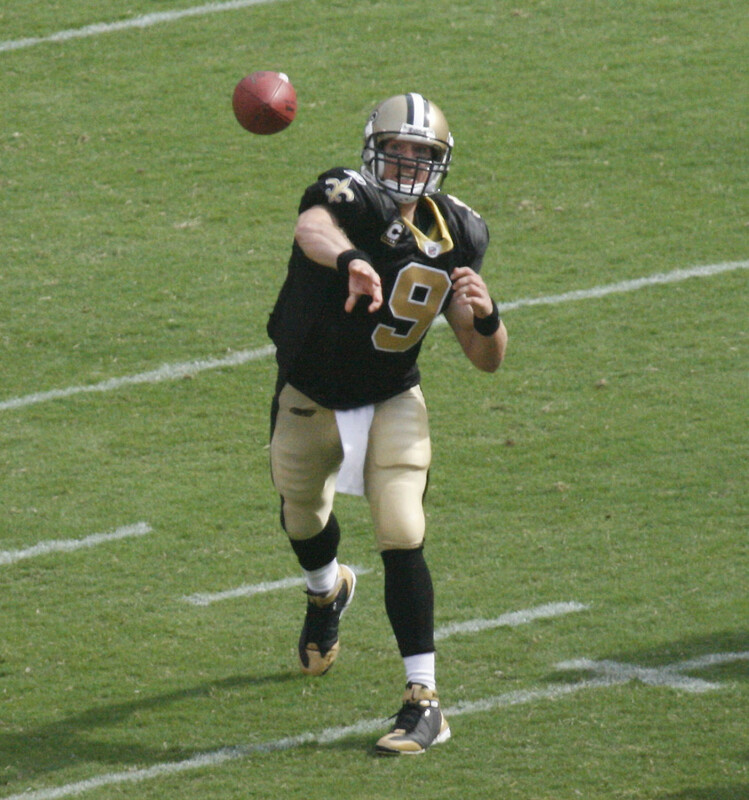 He has no major accolades and is best known for his constant fumbling of the ball. He famously missed an open dunk. This has been attributed to his visibly small hands. They looked tiny for a man his size. While there are no official measurements, he was reportedly unable to palm a regulation-sized basketball. While there is no official measurement, KD has openly admitted that he is unable to palm a basketball. This is rather surprising considering he is 6'9". This means his hands are quite small for a man his size. This obviously has not been detrimental to his career. 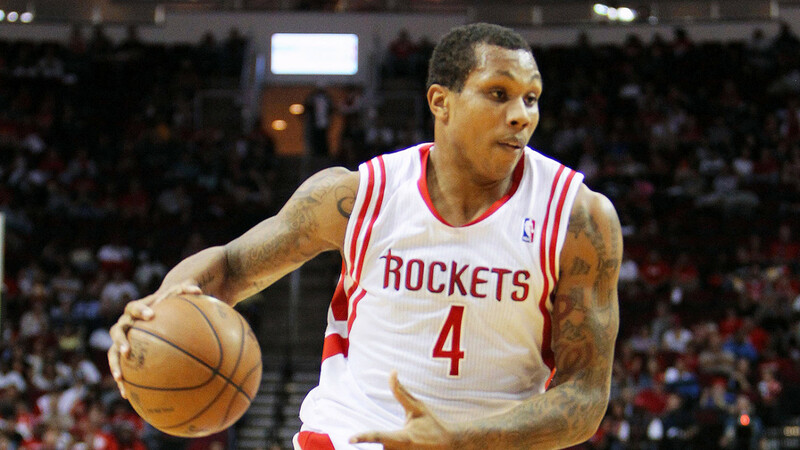 He is one of the top players in the league and is a two-time NBA Champion. Small hands didn’t deter this 6’6” beast from winning the NBA Most Valuable Player Award in 1993. Charles Barkley allegedly couldn't palm a basketball and this is somewhat believable as 99% of his dunks were two-handed. Moses Malone possessed the hands of a 5’9” man despite standing at 6’10”. He could palm the ball but couldn't dunk and control the ball like so many small guards. Because of this, Tom Nissalke, the Rockets' coach, gave him a series of hand-stretching exercises, like those for a pianist. This didn’t stop him from being a three-time NBA most valuable player and one of basketball's most ferocious rebounders. Davis has rather small hands for a man who is 6'10". When he was at the Draft Combine, they were measured at nine inches in length and 8.5 inches in span. This means he is unable to palm a basketball. This was actually a concern about him in the draft despite being a top prospect. Fortunately, his hands have not been a hindrance. He is a five-time All-Star and one of the top stars in the league. Patrick Ewing had pretty small hands for a man that stood at almost 7’0”. Ewing was able to overcome whatever mild challenges imposed by having smaller hands. He is one of the greatest centers in NBA history and one of the greatest players to never win an NBA MVP. Carmelo Anthony revealed during an interview that one of his biggest secrets was that he couldn't palm a basketball. This is rather astonishing considering he is 6'8". This means he has relatively small hands for his height. Carmelo’s hands, however, have not hindered him from being one of the most prolific scorers in NBA history. Shawn Kemp wasn’t blessed with big hands despite standing at 6'10" but this didn’t stop the Reign Man from being one of the best dunkers in NBA history. Unfortunately, Kemp is one of the best NBA players who won’t make the Hall of Fame. Randle was measured at the Draft Combine to have a hand length of 8.75 inches and a span of 8.25 inches. These numbers are quite small considering he is 6'9". He was a seventh pick for the Los Angeles Lakers. His career has so far been uneventful. Being tall naturally comes with huge hands. It’s not surprising that the largest hands on a living person belongs to the tallest living man, Sultan Kösen. At 8’3", Sultan’s hand length and span measure a staggering 11.22 and 12 inches respectively. However, the largest hands ever measured belonged to Robert Wadlow, the tallest man ever, who stood at 8’11". His hand length measured a whopping 12.75 inches. Unfortunately, there is no reliable data on his hand span though one can safely assume that it should at least be 13.5 inches. Kösen and Wadlow may have the largest hand sizes but are they really impressive for their height? 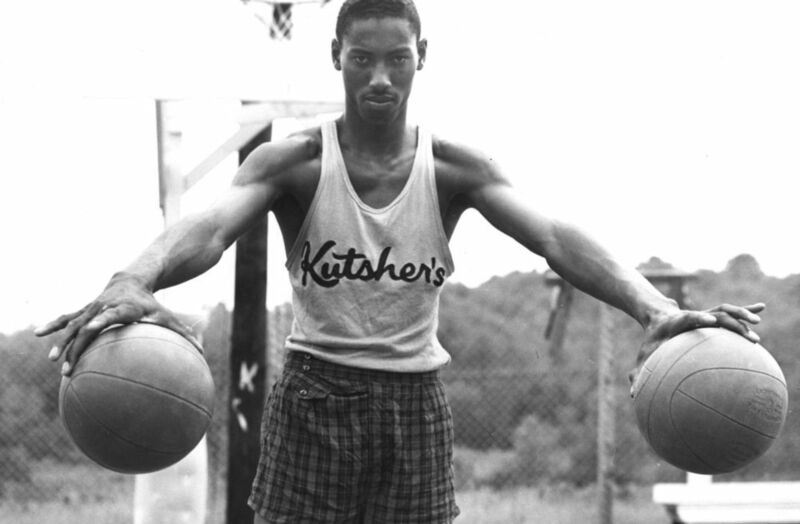 Let’s take a look at the hand size of the great Wilt Chamberlain. His length was 9.5 inches and his span was 11.5 inches. His length was around 28.4% longer than the average and his span was about 35.3% wider than average. However, considering the fact that the average U.S. man stands at 5’10" and Wilt stood at 7’1", this doesn’t present the whole picture. The average hand length and span of a 7’1" man is roughly 9.2 and 10 inches respectively. If we compare Wilt’s hands to the average for his height, we see that his length is only 3.3% longer while his span is 15% wider. Being tall does not guarantee large hands. At 6’2", Donald Trump has a hand length of 7.25 inches. The average for that height is roughly around 8.4 inches. Therefore, Trump’s hand length is really small if you take his height into consideration. Isaiah Austin has both a hand length and hand span of 8.75 inches. He stands at 7’1", just like Wilt Chamberlain, so his hands are also really small for his height. There also cases of individuals with huge hands relative to their height. Jimi Hendrix was rumoured to have a hand length of 10.75 inches despite standing at just 5'10". It was believed that his unusually large hands contributed to his status as one of the greatest guitarists ever. The hand size of NBA star Isaiah Thomas is only 8.3 inches in length and 9 inches in span. He is an inch below the average U.S. male height and the fact that his hand length and span are around 12.2% and 5.9% bigger than average is pretty impressive. Which one of these players do you think utilised his big hands the most? How big are Shaquille O'Neal hands? Who are some great NBA players with small hands? What is LeBron James' hand size? What is Stephen Curry's hand size? What's Zhaire Smith's hand size? Zhaire Smith's hand length measures 8.75 inches and hand span 8.25 inches. At 6'4," his hands are quite small for someone his height. What is Dwyane Wade's hand size? Dwyane Wade's hand size seems to be around the same size as Lebron James which is 9 inches in length and 9.25 inches in span. It is quite remarkable if you consider the fact that Wade stands 4 inches shorter than James. What is the hand size of Brittney Griner? Brittney Griner has a hand length of 9 inches, and a hand span of 9.5 inches. She has the same hand length as Lebron James, and surprisingly a wider hand span than James. What are the size of Donald Trump's hands? At 6’2, Donald Trump has a hand length of 7.25 inches. The average hand length of a 6’2 person is roughly around 8.4 inches and hence Trump’s hand length is really small indeed if you take his height into consideration. What is the hand size of Victor Oladipo? Victor Oladipo has a hand length of 8.75 inches and a hand span of 9.25 inches. At 6'4," his hand length is slightly longer than the average for his height, though his hand span is right about the average for his height. What is the hand size of Lonzo Ball? Lonzo Ball hasn't had his hands officially measured. However, he seems to have pretty average if not small hands for a 6'6" guy, which means his hand length should be around 8.7 inches and hand span around 9.1 inches. How big are Kobe's hands? Kobe's hand length is 9.125 inches. Unfortunately, there is no reliable data on his hand span. What is OG Anunoby's hand size? OG Anunoby has a hand length of 9.25 inches and a hand span of 9.5 inches which is pretty average for a 6'8" guy.